The weirdest thing about having a blog is that I keep things that I have used up just so I can give you the 411 on how they were, if i would get them again and if they were amazing or not. For the past few months i have had some awful knee joint pains and neck pains and everything and anything has been put on both the areas to see if it helps. The only thing that has helped ease the pain at night and help me sleep is this rollerball, applying a thin layer cools the area down and makes life a lot easier. I wanted to finish the wash as quick as possible because I found another one that is even better. This face wash is amazing and does the job of cleaning your face thoroughly, however the price of all freederm products is really off putting and for that reason alone I wouldn't repurchase it but also because you can find way better ones for half the price. I still to do this haven't written a full review on this product and god knows why not because I can't say anything bad about it! This primer lasts all day, has spf in it making it amazing for the summer, and the weird texture at first is hard to use but afterwards it sinks into the skin and gives you a base for your makeup. I need to buy this again on my next trip to the shops! This was a little sample I received in the LIB Summer box and after hearing a lot of people rave about this wonder tonic, and on twitter during chats on a sunday about skincare I always see this product coming up. So when it came in the box I just had to try it! I went through the little bottle within two/three days and loved using it on my skin. It didn't react like I thought it would because of it been quite harsh and my skin got a double clean. One day when I can justify it I will be buying the full bottle version. Looking at the bottle of this foundation it looks like there is a lot of product left in, but there isn't *emoji crying face* the pump has given up on me and won't give me anything else and the bottle doesn't open to even scrape it out. Which is very very annoying. Since it running out I have bought another bottle that is a shade darker due to my summer glow and have missed the original formula after using the matte one for so long. If you are looking for a foundation that is lightweight, amazing coverage but not to pricey then this is the one for you. 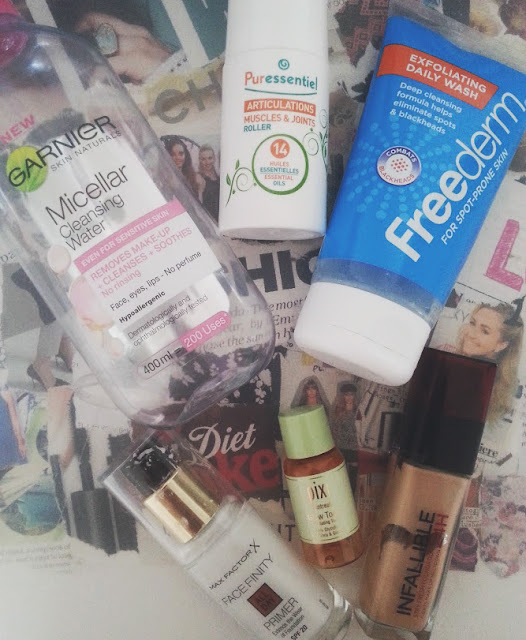 That's it for this months empties! What products have you used up recently?